Includes 4 bags, 1 pre-filter, 1 standard filter. Fits Miele S400, S600, S2000, S5000, S8000, Classic C1, Complete C2, & Complete C3 series. 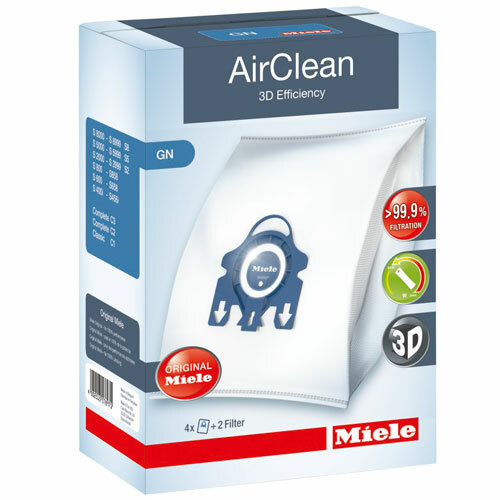 Miele's revolutionary and patented Type GN AirClean™ vacuum bags feature 9-layers of electrostatically charged material and a spring-loaded, self-locking collar. These large capacity vacuum bags hold 4.76 quarts of dry debris. Includes 4 dustbags, 1 pre-motor filter, 1 Airclean standard filter. Fits Miele S400, S600, S2000, S5000, S8000, Classic C1, Complete C2, & Complete C3 series canister vacuums.